Ahead of Wimbledon 2018, SI experts make their bold predictions, review the top storylines and pick the men's and women's winners. With the Wimbledon set to kick off on Sunday at the All England Club, SI's tennis experts and writers Jon Wertheim, Stanley Kay, Jamie Lisanti and Daniel Rapaport discuss this year’s top storylines and predict the winners. What, if anything, did you learn from the grass court lead-up tournaments? Stanley Kay: I missed Andy Murray. It’s quite nice to have him back, albeit somewhat diminished at the moment. Speaking of comebacks: One loss to Borna Coric notwithstanding, Roger Federer remains Roger Federer, on grass at least. Serena Williams hasn’t played since the French Open, but (as always) she looms large: her No. 25 seed, a drug-testing controversy and of course Alexis Ohanian Jr’s strong social media presence. And assuming Petra Kvitova’s hamstring injury is minor, the two-time Wimbledon champion looks like a favorite to win it this year after winning Birmingham. Jamie Lisanti: Grass court lead-up tournaments are a double-edged sword. On one hand, for the men, these matches (and outright participation in these tournaments) directly affect the seedings at Wimbledon. But for many, because of the short time in between the French Open and Wimbledon, and because of the trickiness of the grass surface, lead-up tournaments aren’t always on the schedule for players before stepping foot at the All England Club. It’s OK if you don’t play in between. Thus, I don’t think the results coming into Wimbledon say much about a player’s form. Roger Federer losing to Borna Coric at Halle? Maria Sharapova pulling out of Birmingham? Marin Cilic beating Novak Djokovic at Queen’s Club? Kyle Edmund defeating Andy Murray at Eastbourne? Make predictions based on those results at your peril. Daniel Rapaport: Not much, given the brevity of the grass-court "season." Nontheless: Federer is still the best grass player in the world but a semi-wide margin. Andy Murray is nowhere near ready to make a deep run at a slam. Novak is inching making progress. Nick Kyrgios is...not. Which player off the radar do you see as a potential dark horse? Jon Wertheim: I’ll say Milos Raonic, who reached the finals—beating an injured Federer along the way—in 2016 and has scarcely been heard from since. For the women, maybe Ash Barty (Bash Arty?) whose aggression and athleticism and networking skills ought to be rewarded on the lawns. Stanley Kay: How about Milos Raonic? 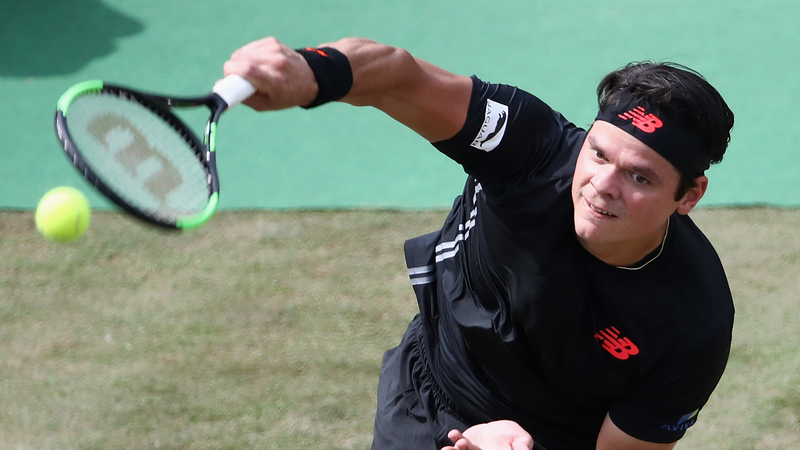 A finalist in 2016 and a quarterfinalist last year, Raonic is again rediscovering his form on grass, reaching the final in Stuttgart after a monthlong layoff. Borna Coric just beat Roger Federer on grass in Halle, so he’s definitively on our radars, but the 21-year-old looks like a formidable grass player. Another player to watch: Karen Khachanov, the 22-year-old Russian who reached Wimbledon’s third round last year and made the fourth round at Roland Garros last month. After beating Mischa Zverev in Halle, Khachanov eased by Kei Nishikori before falling in three sets to Roberto Bautista Agut. On the women’s side, look out for Ashleigh Barty. She beat Naomi Osaka and Johanna Konta on her way to a Nottingham title, and she followed that up with a decent showing in Birmingham and a quarterfinal appearance in Eastbourne. She’s yet to make it past the third round at a Slam in singles, but her breakthrough feels imminent. Jamie Lisanti: Does a recent semifinalist count as a dark horse? Sam Querrey has a shot to make some noise (again) on the grass. I’ll throw Mihaela Buzarnescu into this pool again. Belinda Bencic—a name you likely haven’t heard in awhile—is a former top ten player and she could make a deep run on the grass. And Karen Khachanov, who made the third round here last year. Daniel Rapaport: Pardon my calling a 12-time Grand Slam champion a dark horse, but that's exactly what Novak Djokovic is right now. I really liked what I saw from Novak at Roland Garros—the loss to Cecchinato felt flukey, and he looked as fit as he has in quite a while. At Queens Club, he lost a tight three-setter to Cilic, who reached the final at Wimbledon last season. Oh, and he's won this tournament three times. Depending on the draw, I could see Djokovic making it to the semis. It looks like Andy Murray will give it a go and play his first major since last year’s Wimbledon. How do you rate his chances of making a run into the second week? Jon Wertheim: Not good. Applaud Murray (and Stan Wawrinka, another Big Fiver on the mend) for giving it a go, as the Brits say. But there’s little to suggest he has health and durability to win three best-of-five matches, required for a Week Two appearance. Stanley Kay: I’d be pretty surprised if he reached the quarterfinals or even the fourth round. Murray looked great against Stan Wawrinka in Eastbourne, but he looked decidedly less impressive in a straight–sets loss to Kyle Edmund. I think Wimbledon’s best-of-five format, at this stage of his recovery, might prove too great a challenge physically. Jamie Lisanti: It’s great to see Andy Murray back on the court after nearly a year away from the game. It’s been a long time since we’ve seen him at his prime. But unfortunately, this is a tough stage for Murray to return to the spotlight in. The hip injury (and surgery) is going to take a long time for him to recover from and Wimbledon is likely not the place where he’s going to make a surge, especially at this point in the comeback. Daniel Rapaport: Somewhere betwen zero and, let's say, 7.5 percent. Don't underestimate the support he'll receive from the British fans—that's why it's a nonzero chance. But he's played exactly three matches since returning from a yearlong absence from tournament play and won one of them. You do the math. Serena Williams was seeded 25th. Is that the right number? Is she the favorite? Jon Wertheim: I’m okay with that number, though I would have hoped for something in the 12-16 range, which would have given her assurances of playing no higher seed until round four. (As a seven-time champ who has won 14 straight matches at the AELTC—and beat a pair of top 20 players just a few weeks ago— she definitely deserved a seeding.) I can't say that she’s the favorite, not with uncertain physical status, not a few months from age 37. But then again, I struggle name a player more likely to win. As resident of Copoutlandia, I would say “a” favorite not “the” favorite. Jamie Lisanti: As the saying (sort of) goes: Seeds are nothing but a number. It doesn’t matter where Serena Williams is seeded, the name next to the number is still Serena Williams. The player pitted against her still feels her powerful wrath from just across the way in the draw. And if Serena’s healthy, watch out. You should never count out a 23-time Grand Slam champion. Mailbag: Is Current Form or Past Slam Performance a Better Indicator of Success in Majors? Daniel Rapaport: A bit of a cop-out from the tournament organizers, if you ask me. If we're factoring in past results, as they suggest they do, Serena has won 14 straight matches at Wimbledon. So by that logic, she has to be seeded at least in the top 15. Then again, she didn't play last year, so how do you accurately weight that? There's no right answer. Let's settle on this: bravo to Wimbledon for seeding her. She's not the favorite, but she's top three, for sure. All depends on that pectoral muscle. Ten years after their legendary 2008 final, what are the odds of a Fed-Nadal rematch? Jon Wertheim: Decent. Especially as they will be in opposite sides of the draw. The hitch is Nadal’s grass court play and recent results at Wimbledon. He reached the final—and won twice—every year he played from 2006-2011. Since then? He has been lucky to survive the middle weekend. Then again, he not moved down the field in Paris, but did so with minimal damage to his body. So who knows? Stanley Kay: As poetic as Nadal–Federer would be, Rafa hasn’t advanced past the fourth round at Wimbledon since 2011, when he made the final. So I’m going to try to avoid getting my hopes up, though I’m already failing: Since I started writing this response, I’ve watched multiple YouTube highlight videos from that ’08 final. Jamie Lisanti: It would be something for Hollywood if it happened again, wouldn’t it? But unfortunately, given Nadal’s meek history in recent years at Wimbledon, it would take some real magic for us to see a rematch in the final. Daniel Rapaport: Let's take a mathematical approach. Cilic, the No. 3 seed, was placed in Roger's half of the draw (why they don't just do 1-4 and 2-3 for the semis is a discussion for another time). His chances of reaching the final are...62%. Rafa hasn't moved past the quarters since 2011, but the Nadal I saw at Roland Garros was close to peak Rafa. No reason to believe he can't have success once again at Wimbledon, a tournament he's won twice. His chances of reaching the final are...27%. I'm no math major, but I believe you'd then multiply .27 by .62. Which gives us our answer: 16.7%. Give us one offbeat storyline to follow. Jon Wertheim: I suspect Serena’s seeding issue will die down soon. But be assured there will be other con-TROV-ER-sies, as the Brits say. No matter how it breaks, the saga of Djokovic and the whereabouts of his self-belief will be a story. Same for Maria Sharapova. How will Nick Kyrgios interact with water bottles? Stanley Kay: As if we need another geopolitical crisis, there seems to be a nonzero chance Roger Federer will ditch Nike for Lacoste. Those iconic RF-brand hats, extraordinarily popular among fans, could soon become a relic. Don’t do it, Roger! Jamie Lisanti: Do yourself a favor and follow @Wimbledon on Twitter. Of the four Grand Slams, Wimbledon is by far the best on the platform and it’s a pleasure to watch the matches and the tournament’s feed at the same time. For a major so rooted in tradition and history, I love that the All England Club has some social media chops. Daniel Rapaport: It'll be settled by the first round, but this Roger Federer sponsorship deal is inexplicably fascinating. Would he dare leave the Swoosh for Lacoste? Uniqlo? Scandalous! Who wins the men's tournament? Jon Wertheim: I’m going out on a limb and selecting a man who is nearly 37 years old. Sounds preposterous, we grant you that. But sometimes you need to be bold. Seriously, how do you pick against Federer? He took off the clay season. He’s the defending champ. Best-of-five helps him stave off a hot opponent. And—Marin Cilic, his prey in two recent Majors? Nadal, whom he’s beaten five straight times NOT on his preferred surface? Floundering Novak Djokovic? Kyrgios, whose attention span barely permits him to get through the five seconds of ads prior to a YouTube video, much less five sets of tennis?— it’s hard to furnish a better alternative. Stanley Kay: Roger Federer’s playbook to win Wimbledon worked perfectly last year, and there’s no reason to think it won’t work again this season. Jamie Lisanti: Does this ever get old? Roger Federer, Wimbledon title No. 9, Grand Slam title No. 21. Daniel Rapaport: Give me Rafa! I know, I know, he hasn't played well on grass. I know, I know, Roger Federer is Roger Federer. But as Blue Suede said, I'm hooked on a feeling. Who wins the women's tournament? Jon Wertheim: I like Kvitova, two-time champ, but am nervous about her durability. Simona Halep must be emotionally fried. Caroline Wozniacki should be better on grass than, historically, she is. Garbine Muguruza, the defending champ, is the human version of the Press Your Luck board. (No Whammy!) Madison Keys is “when” not “if” but still hasn't earned full faith and credit on grass. What the hell, we’ll pick TWO players who are almost 37 years old. Serena Williams. Jamie Lisanti: It’s a gamble, but I’m picking Garbine Muguruza to successfully defend her title and win for the second time at the All England Club. Stanley Kay: I’m picking Garbine Muguruza to repeat as champion. Sure, she lost to Barbora Strycova in a lead-up event, but worry not: Last year, before winning Wimbledon, she also lost to Barbora Strycova. Serena Williams will show enough progress to emerge as the favorite for the U.S. Open. Daniel Rapaport: Feels about time for another Serena conquest, doesn't it? We'll never know how far she'd have gone in Paris, but she looked to be improving with each match before the pectoral muscle. If she's anywhere above 80% fit, she's going to be really tough to beat.